The skin is your body’s largest organ, so give it some TLC with our Endoca CBD-infused Skin Care range. Made from organic, food-grade ingredients such as coconut oil, shea butter and vanilla, these luxurious CBD skin care products are so pure that you can eat them. But we’d recommend slathering them all over your body instead for some CBD goodness. 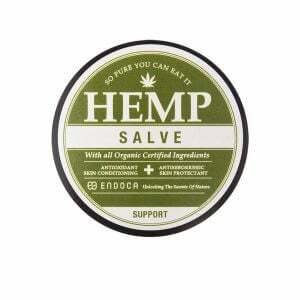 Not all CBD creams are created equal, with many hemp oils for skin containing barely any CBD at all. This isn’t the case with Endoca CBD Skin Care products, which are packed full of CBD. 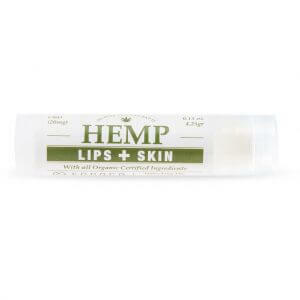 Our Hemp Salve contains 750mg of CBD, our Whipped Body Butter 1500mg of CBD and our Lips+Skin 20mg of CBD. Plus, we have the purity tests to prove it. CBD (otherwise known as cannabidiol) is fast becoming the skin care ingredient of the moment. We extract CBD from organically certified hemp grown in Europe, adding only natural ingredients that have been shown to moisturize and nourish skin. 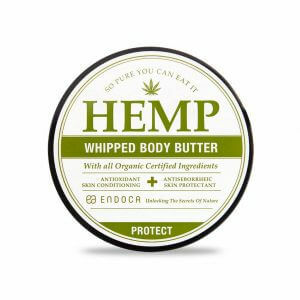 What are the CBD hemp oil for skin benefits? It’s little wonder that CBD is becoming so popular when you consider its anti-inflammatory and natural oil regulating effects on the skin. That’s why we’ve decided to use our expert know-how in producing high quality CBD extracts and create our Endoca high in CBD Skin Care range. Many of you will have heard of the endocannabinoid system – the complex communication network of cannabis-like chemicals (endocannabinoids) and their receptors. Scientists now know that the endocannabinoid system is also involved in the maintenance of healthy skin and the regulation of skin cells, hair follicles and sebaceous glands. It is believed that CBD can boost our endocannabinoid system, helping it function more efficiently. Much has been said about CBD’s potential anti-inflammatory effect and it is one of the reasons CBD is of particular interest for problem skin conditions where inflammation is present. Inflammation can occur due to an overactive immune response, such as an allergic reaction. CBD has also been found to possibly regulate the production of oil in our skin, making it of interest for conditions like acne. All of our CBD Skin Care products contain 100% natural ingredients, but it is always advisable to do a patch test on a small area of skin before using the products on a regular basis. This is particularly important if you are thinking of using CBD cream on children and infants. Once you’ve done your patch test, simply apply the product to your skin and smooth over. You can apply to your body or even use our CBD hemp oil for your face.